Lyca Productions logo off from upcoming Kaththi banner, so all issues resolved? A meeting between the members of pro-Tamil groups and theatre owners, distributors and producers is scheduled for Monday. Home » Anirudh | Murugados | Samantha | Vijay » Lyca Productions logo off from upcoming Kaththi banner, so all issues resolved? 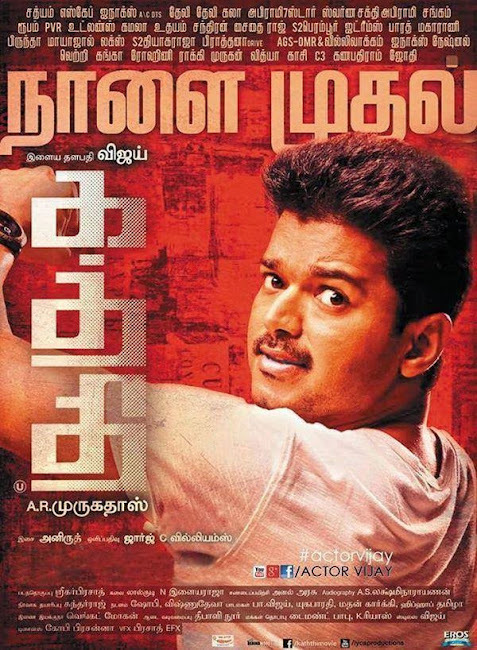 Theatres and multiplexes in the state are yet to open bookings for ‘Kaththi’. “Most theatres in the state suffered lot of damage when ‘Vishwaroopam’ released. We are not going to face a similar situation again and we intend to release the film only after an agreement is met between both the parties,” a member of Tamil Nadu Theatres Owners Association, told IANS. “The fate of the film depends on today’s meeting. We will have more clarity about the film’s release by evening,” he said. Meantime, the official page of Actor Vijay has put up the next days advertisement in which the Logo is removed. Please check the photo above. Is it a hint that Kaththi team is all set to release the movie all over the globe including in Tamilnadu and the issues with the Tamil group has been resolved? See the latest Banner for Kaththi which has no Lyca Logo on it, compare it with the banner designed yesterday (released on today's paper ad). Lyca Productions, however, plans to release the film on Wednesday in rest of the country and the world. “We don’t intend to postpone the release because everything has been planned in advance. The film will release outside Tamil Nadu and other foreign countries well,” a representative from Lyca said. Vijay’s last release ‘Thalaivaa’ faced a similar fate and released in Tamil Nadu few weeks after its initial release worldwide.